“He’s playing a character” and is nothing like his online persona, attorney Randall Wilhite reportedly insisted in a Texas courtroom at a pre-trial hearing ahead of the right wing radio jock’s custody battle with ex-wife Kelly Jones. Judging Jones by his Infowars performances would be like judging Jack Nicholson by his depiction of the Joker on “Batman,” Wilhite told state District Judge Orlinda Naranjo last week, the Austin American-Statesman reported. Kelly Jones is seeking sole or joint custody of her three children, ages 14, 12 and 9, with her ex-husband, an ardent supporter of President Trump who broadcasts from his Austin home. “I’m concerned that he is engaged in felonious behavior, threatening a member of Congress," she added, referring to Jones’ recent comments about Rep. Adam Schiff, D-California. "He broadcasts from home. The children are there, watching him broadcast." There was no immediate response to Kelly Jones' claims from Jones, 43, who is also known for pushing other widely discredited claims like the moon landing was faked and the Sandy Hook Elementary School massacre was staged. Meanwhile, lawyers for the warring Joneses began seating a jury in the Travis County courthouse for what’s expected to be a contentious two-week hearing, court officials confirmed. The couple divorced in 2015. Jones reportedly pays his ex-wife $43,000 per month, according to the Austin paper. 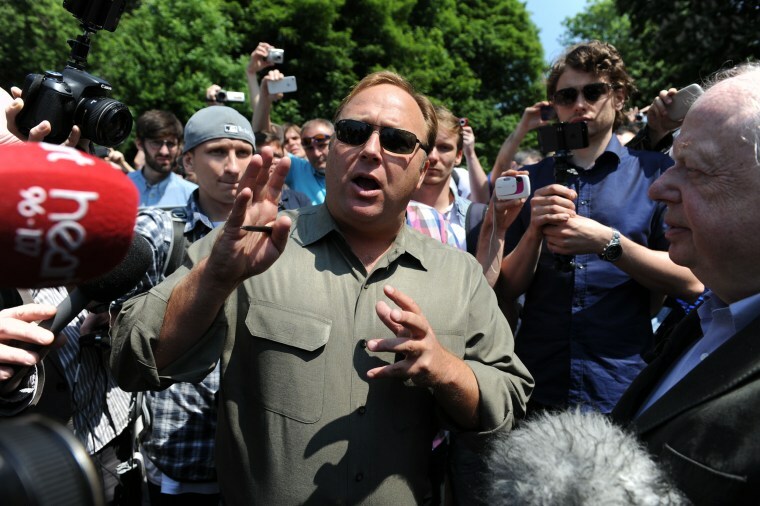 Jones’ Infowars site was a hub for anti-Clinton conspiracies during the presidential campaign and Trump publicly thanked him for his support. Jones claimed later that a victorious Trump later reached out to thank him and his listeners for his support.